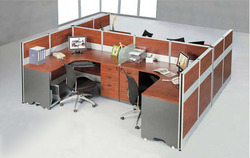 Modular Workstation are ergonomically designed keeping in mind the diverse and mobile professionals of today.These partition features aluminum framework construction for elegant looks, metal-to-metal connections for extra strength, modular design to fit almost any application, and easy installation. Ideal for managerial, administrative and other operational areas, these workstations support the requirements of one and all. These workstations are not only simple to re-configure but also offer provision for complete concealed wire management through single or double aluminum raceways as per clients requirements for LAN wiring. 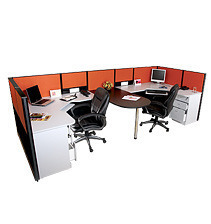 We specialize in custom designing Modular Workstations to fit the specific needs of our clients. Pre-laminated particle board is used below the worktops whereas above the worktop Pin board and white marker board is provided to pin up important documents and to write important information respectively as per the clients requirements.Worktops are made from 25 mm prelam board with 2 mm PVC edge banding tape. Multipurpose Drawer Pedestals with three utility drawers made in Prelam board, Powder Coated CPU Trollies in metal,Keyboard trays in Plastic or in metal with channel and other accessories can also be provided as per clients requirements. 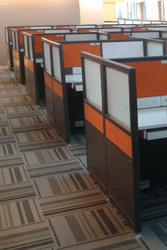 Latest Design in Modular Worstations. Powder Coated understructure with Pre Lam Board Top. 18mn Magnetic Pin Board Screen fitted on Elegant Powder Coated 'U' Brackets. Concealed Metal Raceway running under the Table Top with cut outs for Modular Switch Plates. Hanging CPU Stand. Mobile Pedestal having two Drawers with a cushion seat so as to accommodate a guest coming for meeting. Seat Size : 1200 x 600 x 750mm. 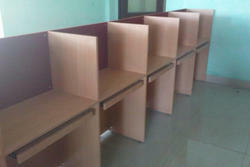 Workstations in 18 mm Pre Lam Particle Board with Pin Board in Front. Keyboard provided for each seat. Type : Wall Facing. Size : 750 x 450x 750mm. Front Panel : 1200mm Ht. 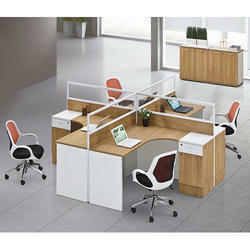 Panel Based Modular Workstations in 45mm and 60mm Thk. Profiles. Suitable for Call Centres , Offices etc. Modular Workstations in 45mm OR 60mm Thick Panel based partiton system having powder coated Aluminium profiles with concealed raceways one at skirting level for Lan and second above the Table Top level for electrical wiring. Above the Table Top level Pin Board OR White Writing Board can be provided as per customer choice.Three Drawer Pedestal for storage purpose , CPU Trolley in metal(powder coated) and Keyboard Tray in metal ,plastic or pre-lam board can be provided as per customer preference. 8mm thick etching glass in 'D' shape has been provided for privacy and seperation between two seats. 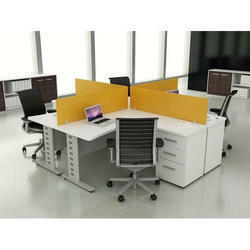 Modular Workstations in 45mm OR 60mm Thick Panel based partiton system for senior executives.25mm thick Pre-Laminated Particle Board 'L' Type Worktops with a extended 'D' Top supported on a Table Leg in between for face to face interaction with each other.Three Drawer Pedestal having two stationery and one filing drawers for each person and also a Keyboard Tray for both executives.Concealed raceways sepeprately for Lan and Elelctrical wiring below the Table Top level .Pin Board OR White writing board above the top level in front of the executives.?? 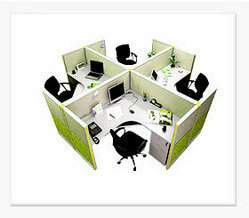 Looking for Modular Workstation ?